Ok, well I managed to have a wee peek inside my Tam KT. Here's a shot of the Sherman LH box compared with the King tiger LH box. They're both around 42mm broad by 90mm long, and so is the Jagdpanther frame. Surprise, surprise, the Pz IV box would also fit nicely. Apart from the shine on the motor, and the KT box frame's height above the tank floor (spacer/stand-offs account for that), they both appear identical. I guess, all Tamiya would have to do to change the ratios would be to put an extra tooth, or two on the pinion gear. The minuscule increase in circumference wouldn't affect the diameter enough to mean changing the adjacent transfer gear. But that's just speculation. Here's the Jagdpanther kit's LH frame compared with the KT unit for breadth. They're identical. Finally, well, here's my low mileage (yardage, really) Tam KT. She needs someone like Tom, or Adam to apply to subtle weathering and pin washes. When the weather improves in the Spring, I'll have a go myself. I imagine someone's done a study of Tamiya tank transmissions (ratios, torque stats., etc); but I'm not quite that nerdy. Yet. 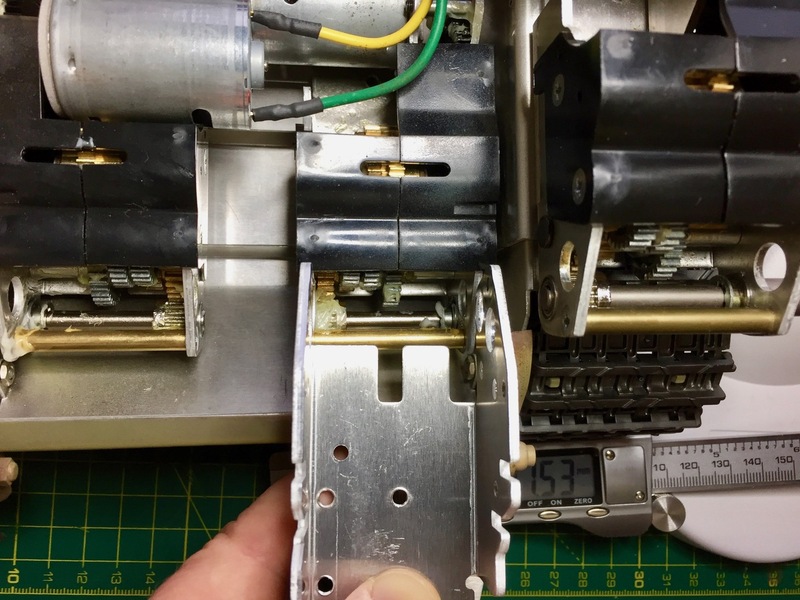 As things stand, though, in spite of the different part numbers and, it has the be said, pricesof Tamiya gearboxes, after a cursory peek, many appear to be pretty much the same. Stand-off positions and output/driveshafts seem to make the difference. 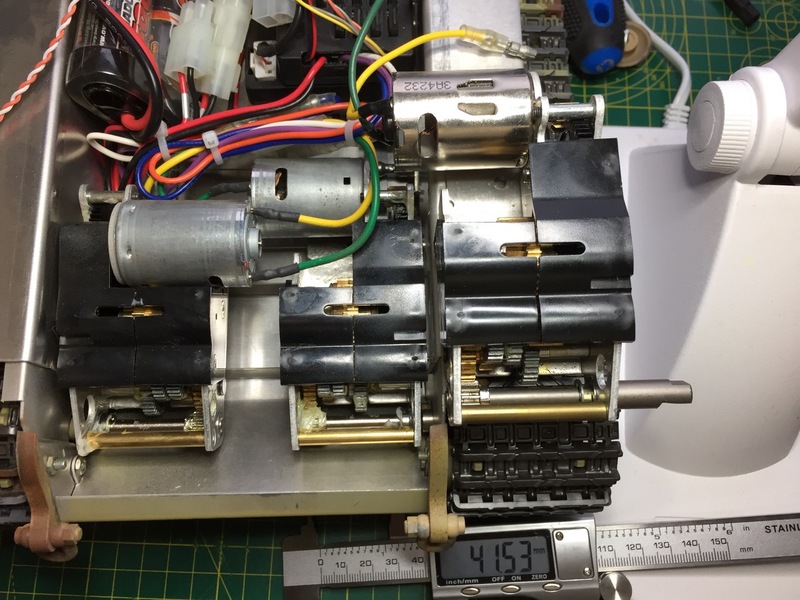 That gives you some scope for using the included Kit parts, if you can come by used gearbox bits, or even gearbox replacement kits somewhere online.. I'm fairly new to Tamiya kits (of any description), having only indulged in the last couple of years. There are bods out there with far greater intimacy with Tamiya tank products than I have. Still, I think I've almost taught myself something about their transmissions I didn't know before. Hope it all helps anyway. Not had any issues with tamiya the gearbox , but would not buy another full rc kit. You need the schumo gear reduction for something that resembles scale speed . Same with HL and Taigen too fast, Tried an IBU but did not like the need for a pc to set up system, mac user . 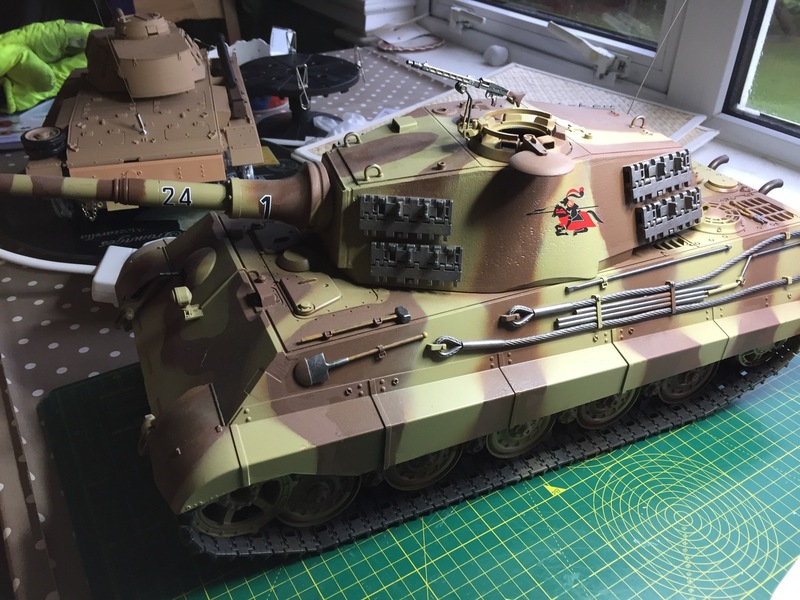 Have Elmod in 3 tanks , will convert the full Tamiya KT to Elmod in the future. Would pay good money for a 1/16 version of the 1/35 Dragon, Meng ,Trumpeter or Tamiya tanks that have the rc hull and all the detail out of the box. Ok, the sleeping Giant has woken! Not a big poster but I will reply to this thread.. Lookie here, the Tamiya Gearboxes are in fact made by Zues, blessed by Apollo and then kissed by Athena before ever leaving the factory. The HL gearboxes are made by GM and are certified to fail and or rust at a moments notice. Just an FYI, on a quiet night in Texas you can hear a GM rust. Ok back to the matter at hand. Seriously, we all need to remember a few things here, these are models, they are built to be Models. Neither Tamiya nor Heng long, Taigen, Torro etc etc were designed to see such continued use as some see. This topic has been covered before, I always get a little excited when folks talk about premature wear, especially in the Tamiya. Its just not true! Sure, if you run a tank with no regard to the proper care and maintenance well, you will get a failure... Run your car on the same oil for 200,000 miles or KM which ever, you will get the same outcome. 1. Use the proper grease for the boxes, I use GE dielectric grease, is is exceptional for this---I will argue at length with anyone who says other wise. I have worked on equipment for some time in the US Navy, this equipment had brass gears from WW2, they looked new and showed very ltttle wear, they saw alot more use that 100000 tamiya gearboxes. 2. Clean your boxes, this is a no brainer.. I kinda laugh when I see guys running their tanks in the water etc. just running outside will get dust in your boxes. You should get some acid brushes, like these: https://www.amazon.com/Harbor-Freight-T ... B006ZBD95Q I usually cut then down by half that way the bristles are stiffer, these work well to remove the grease from your gears, then use a new one to apply new grease. 3. DO NOT USE ALOT OF GREASE!!! if you have grease collecting around your shafts in globs, your using too much. This can harm your boxes more than too little grease. The problem is that excessive grease will collect dust and dirt, then reintroduce it back into the gears---bad. 4. Do not use grease on bearings! it will have the same affect as too much grease has on gears. Bearings used in the tanks are pre-lubed or dry, depending on the type. If they are pre-lubed then they have a rubber or other type of seal. if you use grease here then any dirt will wear away the outer seal, then would allow dirt to enter the bearing. If you have any experience with automotive engines etc, look at how those are designed. Bushings: Bushings are a type of bearing per see, these are made of material that is designed to wear instead of the device they are installed into, also they are self lubricating--sort of the type of metal used has less friction.. you can lubricate these with the dielectric grease but remember these should also be kept clean after use. Ok, that is my 2.8234342384534 cents. Ah..thanks for your expansive take on the longevity (or otherwise) of Tamiya's gearboxes, E.F. I must say, before I moved to arts subjects, I had several years studying engineering and sciences. That gave me a taste for well-engineered designs..from the Spitfire's wing through to Samuel Darby's bridge masterpiece at Coalbrookdale. Tamiya gearboxes look, and feel so well engineered. A class act when compared with the opposition. But it wouldn't have been Zeus who made them; it would have been his smithy- Hephaestus! I can see blobs of Tamiya grease on my KT's gears (above), but it has been in storage. Well, that's my excuse. Come the summer, it will be serviced properly. I promise. My tanks don't clock up many yards in the year, and so wear is never likely to be an issue. However, it seems to me from the genuine precision fit, that they could certainly rack up plenty of miles over the years without those WFT moments. Incidentally, It might be relevant to point out that Tamiya recommends putting their own (supplied) grease into bushed housings, and wheel bearings (properly: bushed bearings). It seems like good stuff to me...but not in excess. But going back to Smaily's question, what do you think his best bet would be? it would have been his smithy- Hephaestus! I stand corrected Though, are you sure that they were not kissed by Athena? Hmmm will ponder this. I believe the grease you speak of could be the ceramic grease or their version of the dielectric grease. The gears I was speaking of in the navy were made of brass, inside bearing plotters etc. like I said, alot of them were from WW2 still used on some older ships as they work really well and accurate. The Navy would clean them monthly and re-grease them with dielectric grease. good stuff..
Another thing I failed to mention is that these tanks were not designed for, but handle well metal tracks.. Given the extra stress I think the gear boxes handle it well... Carpet is a killer as is grass...Other than that, my gear boxes love me without fail..